/ FAQ / FAQs / What are Templates? CF7 Skins Templates are the structure of your form, providing the content and layout. They act as an easy to follow guide or framework that can be adjusted to your particular needs. The Template tab includes a range of commonly used form templates for different categories and purposes – such as a Contact Form, Customer Survey, Event Registration, etc. When you select a Template, it’s like getting a head start. The CF7 Skins visual form editor (Form tab) and Contact Form 7 tags are automatically updated for you. Below is an example of the Contact Form Template on the Form tab. With the structure of the form provided, you can immediately start to customize it. 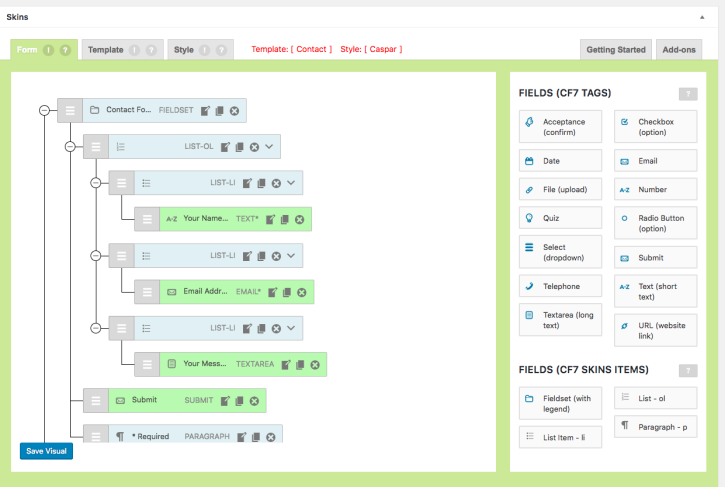 Add, edit, duplicate, or remove fields without worrying about tags or typing out the field syntax correctly. To get started finding a template for your form, within the Skins section, click the Template tab.